A wrinkled outfit can spell disaster especially when you’re going out on a date, attending a special occasion, or trying to score up at a job interview. Not only does it make you feel terrible, it also makes you look less confident. But ironing clothes is a struggle too, which is why many people end up spending more for a laundromat service. Well, there’s actually a cheaper, much better option: buy a clothes steamer. A clothes steamer is relatively inexpensive and very useful. Once you try it, you will never go back to ironing your clothes again. Promise. But before you get too excited about purchasing the first clothes steamer that you see on the internet, here’s a collection of in-depth reviews that you shouldn’t miss.Below are the best clothes steamers on the market today. Let’s learn about their pros and cons and their unique features. What types of fabrics will you steam? Offering a competitive range of features, the Rowenta IS6300 Garment and Fabric Steamer does pretty much everything. Because it has a pretty huge tank (holds 81 oz of water) compared to average steamers which typically hold just about 60 oz, this clothes steamer can run continuously for 60 minutes. This should allow you to steam a bunch of garments and fabrics, including upholstery and drapes! The large tank is transparent so it’s easy to check whether it still has enough water. Even more, this steamer has an “auto off” feature that activates when the tank runs dry. Unlike the previous models of Rowenta clothes steamer, this one has a “roll and press” vertical support – a unique, flat board that provides a safe surface for you to steam your clothing, acting like an ironing board. This feature is such a breeze to set up and operates like a window blind: simply pull it down and attach it to the hook. The foot-operated power switch is another smart feature. This steamer comes with three accessories: fabric brush, lint pad, and steamer cap. On the other note, the tallest this steamer can be is 5 feet which makes steaming long apparel a little challenging. Perfect for the busy executives who are always in need of quick clothing touch-ups, Epica Powerful Handheld Garment Steamer is compact, lightweight and reliable. Great for freshening ups, this steamer has pretty cool features, such as the on/off switch for easy control and direct-fill tank that holds up to 7 oz of water. It also comes with a lint remover and fabric brush. You can use it for 12 straight minutes, enough to steam two of three pairs of your business outfit. Packing clothes in a way that they remain wrinkle free when you put them out of your luggage is an art. And if like most people, this is something that you can’t (and don’t want to) master, you will need a heavy-duty tool like the PureSteam Portable Garment Steamer. The first thing you will notice about this product is the ergonomically designed handle which makes steaming a breeze. It heats up in two minutes and can run continuously for 10 minutes. Despite being portable, it does have some features of a standard clothes steamer. These include “auto shutdown” when the device gets too hot or low in water. There have been reported issues about the not so consistent flow of steam. Thankfully, this has been addressed in the latest PureSteam model. The manufacturer claims that it has a new and improved nozzle design that distributes steam consistently and powerfully to the garment. 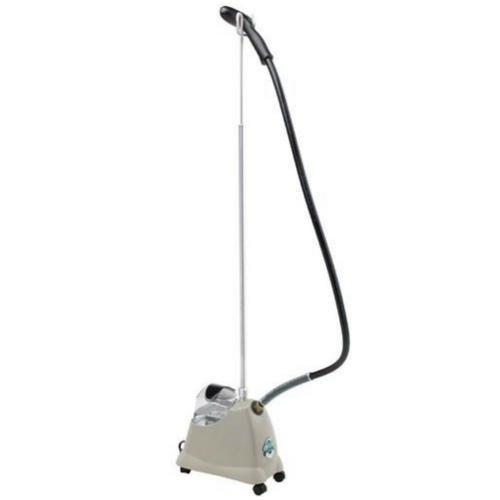 This steamer works well with all types of fabric, including drapes and beddings. Considered one of the best floor-standing steamers, the J-2000 Jiffy Garment Steamer with Plastic Steam Head is definitely a well-thought-out piece of equipment that offers high-quality garment care.This 1300-watt high-performing clothes steamer is one of a kind. It may lack a modern, stylish design but it delivers a high level of performance that you expect from a premium brand. 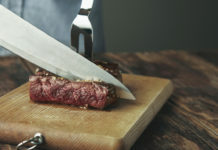 One of the best features of the J-2000 Jiffy steamer is that it has a pretty simple and straightforward system that makes the steaming process super quick and effective. It has a 6-inch steam head that delivers a constant flow of steam, eliminating creases and wrinkles from all sorts of clothes and fabrics, from your everyday shirts and pants to your thick coats, blazers, and even bed sheets. Furthermore, this machine is made with high-impact plastic outer housing for durability. The Jiffy steamer is truly a trusted product by both homeowners and professionals. With over 2,000 reviews on Amazon, the Steamfast SF-407 Fabric Steamer offers many useful features at a budget-friendly price. If you’re looking for a regular clothes steamer for heavy-duty home use but you’re tight on budget, this is a perfect choice. It’s steam-ready in 45 seconds, and the tank provides 45 minutes of steam time. This item is equipped with a detachable and adjustable telescopic pole and a fabric brush to remove lint, lose thread, and hair from your precious clothes. It also features a press pad that acts like an ironing board, preventing your garments from swinging away when steaming. There’s also a built-in clothes hanger for your convenience. Despite its powerful features, SteamFast is not without some minor flaws. First, the rolling casters don’t have a break mechanism which means the steamer tend to move while in use, which can be a little annoying. Another thing, the pole is too short – an issue seen in other premium brands. Offering great features at an affordable price, Deneve Portable Garment Steamer is capable of handling even the most persistent garments. When you’re traveling, the last thing you want to happen to your clothes steamer is to see water spilling out of the steam outlet or lid. With Deneve, leaks are never an issue. This powerful handheld device provides 10 minutes of consistent steaming before refilling. It also has an automatic ‘shutdown’ mechanism to protect the device from overheating or being too low on water. Despite being portable, this steamer comes with cool features for convenient steaming, such as a hook on a suction cup that can be used to hang the clothes you’re working on. There’s an on/off switch for easy control and the power cord is long enough for some maneuverability. There are a few issues with this device though. One is that when you fill it to the recommended water level, the water bubbles and occasionally spits hot water within the first 30 seconds. It also has narrow-set steam holes, compared to other portable steamers. The Joy Mangano My Little Steamer is the go-to steamer for most people, offering great features at a fraction of a cost. Available in a wide range of colors (10 to be exact), this ‘small but terrible’ steamer is a top choice among many consumers. It’s pretty handy at 12.5”, and is able to provide up to 10 minutes of steam. This streamer is powerful enough to remove wrinkles and creases very much effectively. It heats up within 60 seconds, and because it’s light and compact, you can hover it around your clothes with ease. The Joy Mangano steamer has an accurately angled steam outlet designed to effectively eliminate wrinkles and creases quickly. Holding it at the right angle can be tricky, but you can learn to master it over time. Another smart feature of this product is the retractable cord, which makes storage and travels easy. J-4000 Garment Steamer is considered the most powerful commercial steamer in the market. The J-4000 is one of Jiffy’s pro-line series that is specifically designed for commercial use. It can be used for a wide range of clothing, as well as drapes and furniture upholstery. Originally used for large commercial settings where many items need to be steamed in a single sitting, many homeowners are also preferring a heavy-duty powerful steamer such as this. There are a few minor concerns reported by users. First is that it takes some time to heat up, about 15 minutes. However, once it’s ready, J-4000 can steam for two straight hours. Another issue is the 5-foot garment pole which is far too short for long dresses. This means you have to hang the dress on a separate hanging pole. This powerful handheld steamer produces concentrated steam, which makes it 30% hotter than standard portable heaters – a good option for heavier types of fabric. Regarded as one of the most powerful portable steamers available these days, Conair ExtremeSteam offers a unique feature that allows the steam to penetrate clothes made with heavier fabrics such as denim, brocade, poplin, and peau de soie. And because of the very hot steam, the steam also efficiently destroys mites and bed bugs. While it can effectively remove wrinkles and creases in heavier fabrics, the steamer can be adjusted to accommodate lighter fabrics, such as cotton, sateen, and linen. Thanks to its dual-heat technology. The product also comes with 3 removable attachments: fabric brush, creaser, and small cushion brush. The cord is also long (at 9”) for safe and convenient movement. The Beautural Handheld Garment Steamer is another quality product great for steaming clothes, upholstery, sofa, drapes and curtains at home. And because it’s small and compact, it also makes a reliable travel companion. Suitable for most types of fabrics, including cotton, wool, polyester, plush, silk, fiber, nylon, velvet, and linen, this steamer is another great budget-friendly option. It features anti-water and anti-electric leakage protection. When the water is too low or when it gets overheated, the steamer automatically shuts down. The Beautural handheld steamer steams in both horizontally and vertically to efficiently and quickly remove wrinkles and creases. A rubber plug is integrated into the water tank outlet to prevent spills. It also has a one-click trigger that allows you to choose between a manual control steam flow or continuous steam flow. This product comes with a lint remover and fabric brush, plus a measuring cup for refilling the tank. It also offers a 12-month warranty. There are garments that should only be dry-cleaned. The Shark Press and Refresh (GS500) makes it possible for you to sanitize and straighten up dry-only labelled clothing, saving you money and hassle from frequent trips to your local laundromat. What makes this steamer unique is the exclusive heated wrinkle eraser which deeply penetrates, renews, and freshens fabrics. The vertical press pad makes a useful feature too. With it, you can turn any door into a vertical iron board, making the steaming process easier. It also comes with frame attachments, including Vetro clips and bonnets. The steamer comes with instructions on which accessory to use for certain fabrics. The lint brush frame is designed for light fabrics such as cotton, cashmere, and wool, while the delicate frame and steam bonnet are for clothing with lace, silk, and satin. Another wonderful feature of the Shark Press and Refresh steamer is its capability of creating perfect crisp sleeve creases using the vetro clips. Simply hang the shirt on the side hook and press the vertical steamer onto the garment. Clothes steamers come in different types, designs and features. Choosing the best clothes steamer will be dependent on a number of factors, including your lifestyle, steaming needs, preferred features, and budget. Check out these expert-recommended guidelines when purchasing a clothes steamer. First of all, determine what type of steamer you prefer. This will depend on your lifestyle and needs. Do you need a full-sized home steamer or a travel steamer? Take note that there are portable steamers that are also suited for home use. Even if you don’t travel often, if you will not be using the steamer most of the time, you may not need a standard home clothes steamer. Are you looking for a steamer that you can carry around your home or something that will stay put in your laundry room? If yes, look for an upright steamer. It’s larger than other types but very convenient to use because of their features and attachments, which include poles and hangers, steaming boards, and more. Remember that some steamers are easier to transport and some take more space than others. If you travel internationally, you need a steamer that comes with a dual-voltage system or a dedicated converter. Check the packaging for details, including the size and weight of the product. Of course, you want something that’s light and small enough to fit in your suitcase. If your wardrobe consists of clothes with delicate and light fabrics, consider a handheld steamer that has a lower steam output. But if you intend to steam thick and heavy fabrics, including bedsheets and curtains, a heavy-duty full-sized steamer is a better choice. Some steamers have the capability to steam all sorts of fabrics with their adjustable steam options. If you have a wide range of apparel, these multi-functional steamers might be perfect for you. To streamline your search, do set a budget. Remember that steamers come in a wide range of prices, ranging from $30 for budget models up to $200 for premium brands. By determining your usage, you should be able to set a realistic budget. If you will use the steamer more often, you want a stand-alone model that will stand heavy use. Expect to pay $150-$200 for it. Since these premium steamers are durable and long-lasting, they are definitely a good investment. Good water capacity – A stand-alone steamer has a large water tank which allows longer periods of continuous steam. Even a small, travel steamer should be able to hold enough water and steam continuously for at least 10 minutes. Preheating duration – Examine how quickly the steamer heats up. Handheld steamer takes just a few minutes to produce steam while regular floor steamers would take longer (15-30 minutes). Automatic shutdown – This is a very important feature that could save your machine and make it last. When the water runs too low or the motor starts to overheat, the power turns off and stops functioning until it’s cool enough to provide quality steam again. Hangers, steaming board, poles or clips – Check if the steamer comes with accessories that will make your life easier. The best full-sized steamers include hangers, poles, and clips. A board is a very helpful feature too as it prevents the clothes from swinging back and forth while you’re steaming. Good reach – A common issue among many full-sized steamers is having a relatively shorter pole (5”). This allows you to conveniently steam a wide range of clothes, including drapes and upholstery. Energy Usage – Check the fine print to know the steamer’s wattage and energy usage. Some machines require significant power to run them. You can weigh that against paying for dry cleaning services for pressing. If you dream about wearing wrinkle-free outfits that perfectly hang to the shape of your body and without the need to pay extra for someone else to do it for you, it’s time to invest in a good-quality clothes steamer. Depending on your needs and how often you will use it, look for the steamer which has great features, from good water capacity to ease of use and accessories included. Take note that expensive products don’t always mean they are the best for you and that there may be features you may not need. When shopping around, remember the qualities of the best clothes steamers mentioned in this guide and take into account the different factors discussed. This way, you can carefully select the product that perfectly fits your budget, clothes steaming needs, and most of all – your lifestyle.